Major Soccer Fouls | What will get you in serious trouble? In reality, soccer fouls are mostly about common sense. 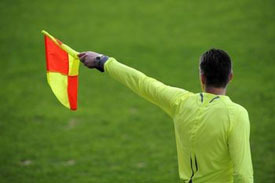 Law 12 covers plays that are prohibited and when committed will result in either a free kick (Law 13) or a penalty kick if the infraction is in the penalty area (Law 14). These fouls can be divided into major offenses, other offenses, and misconduct. Calling "my ball" when trying to win a ball is considered ungentlemanly conduct and will result in a foul....instead its expected you say a player's name like for example: "John's ball!" or "Keeper's ball"
When receiving a red card, you must leave the field of play and are not able to sit on the players bench...usually this means an early trip to the showers!